Rugs that are classified under this type are made from sophisticated materials, and have undergone a unique creation process. Because of these features, delicate rugs such as wool, Oriental, Persian, Silk, and the like are not cheap; but although they are priced higher than the conventional or commercialized rugs, they are still sought-after by a lot of property owners. Delicate rugs are known to be some of the most beautiful indoor accessories that have been created; however, preserving their appearance and structure is easier said than done. With the varying materials and forms, it is difficult to keep these kinds of rugs unsullied – especially if they are placed in high traffic areas, because stains, tears, and discoloration can often follow suit. When it comes to cleaning your delicate rugs, you need to remember that some commercial cleaning solutions will not do. In some cases, these products are made with strong chemicals that can ultimately damage your rug’s color, appearance, and structure. If you are looking for the perfect cleaning product and/or materials for your delicate rugs, be sure to use appropriate products. Acrylic polymer: A water soluble ingredient that prevents the occurrence of stains. It is made of a bond of acrylic acid and esters, which is then combined with other molecules. Phosphorous phosphate (natural form): Helps enhance the stain-removal process. Surfactants: Surface active agents which reduce the tension of a surface, therefore, allowing the water to be distributed more evenly. 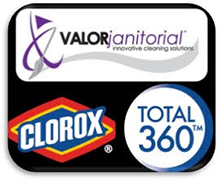 For rugs that need to be treated by a delicate hand, contact Valor Janitorial. Not only do we specialize in commercial carpet cleaning, but we are the number one choice for all professional janitorial and floor cleaning and polishing services, in the surrounding areas of Dallas, Texas and the Dallas-Fort Worth Metroplex. If you are interested in hiring our services, please give us a call at: 214-238-9550 or visit our contact page here.